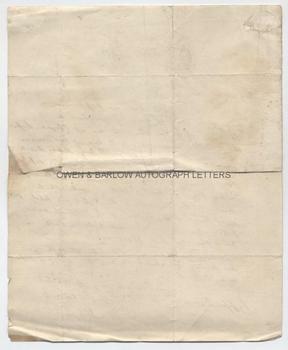 JOHN BRINKLEY Autograph Letter Signed. ALS. 1p. Bangor. 13th May, 1833. To Professor Rigand. 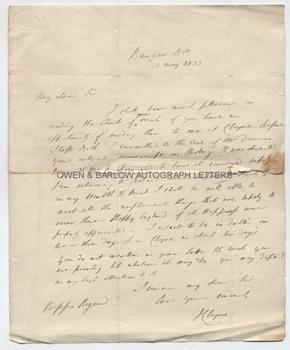 "I shall have much pleasure in reading the sheets of your work if you have an opportunity of sending them to me at Cloyne. Before I left Bath I committed to the care of Mr Duncan your interesting manuscript on Sterling. It was directed to you and Mr D promised to have it conveyed safely. I am returning to Ireland much improved, thank God, in my health and trust I shall be well able to meet all the unpleasant things that are likely to occur there. Happy England if its happiness were properly appreciated. I expect to be in Dublin in two or three days and in Cloyne in about ten days. You do not mention in your letter the work you are printing but whatever it may be you may depend on my best attention to it. I remain my dear Sir, ever yours sincerely," etc. Signed as the Bishop of Cloyne. 4to. Approx 9 x 7.5 inches. Tears and creases along central fold line. Slight mounting traces to blank verso. Good. John Mortimer Brinkley was the first Royal Astronomer of Ireland. His major work was in the field of stellar astronomy and he published his 'Elements of Plane Astronomy' in 1808. Brinkley's observation that stars shifted their position in the sky over the course of the year was disproved, however, by his contemporary, John Pond, at Greenwich Observatory in 1826. John Brinkley was awarded the Copley Medal of the Royal Society and was elected president of the Royal Astronomical Society. In addition to his scientific work, John Brinkley held the appointment of Bishop of Cloyne in County Cork, Ireland, a position he held for the last nine years of his life. Professor Rigand is almost certainly the Oxford astronomer of that name and Fellow of the Royal Society, author of 'Astronomical Observations made at the Radcliffe Observatory, Oxford'. The "unpleasant things" that John Brinkley refers to in his letter are possibly the sporadic skirmishes known as the "Tithe War" which took place in 1932-38 arising from Daniel O'Connell's campaigns for Catholic emancipation in Ireland.